The outside is coated in thin-film photovoltaic cells (something Nanosolar is working on to boost from a current efficiency of 14%) and also has a reversible drive propeller/wind turbine. 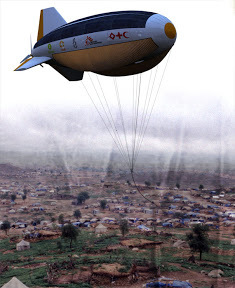 As blimps themselves have a 80%-90% lower environmental impact than jets, such transport would also be earth-friendly. It should also be noted that his blimp uses hydrogen, instead of the fossil fuel helium to achieve buoyancy. Hydrogen is cheaper and renewable — but is also highly flammable; something the author takes note of and points to the unmanned characteristic of his invention as a positive in this case.